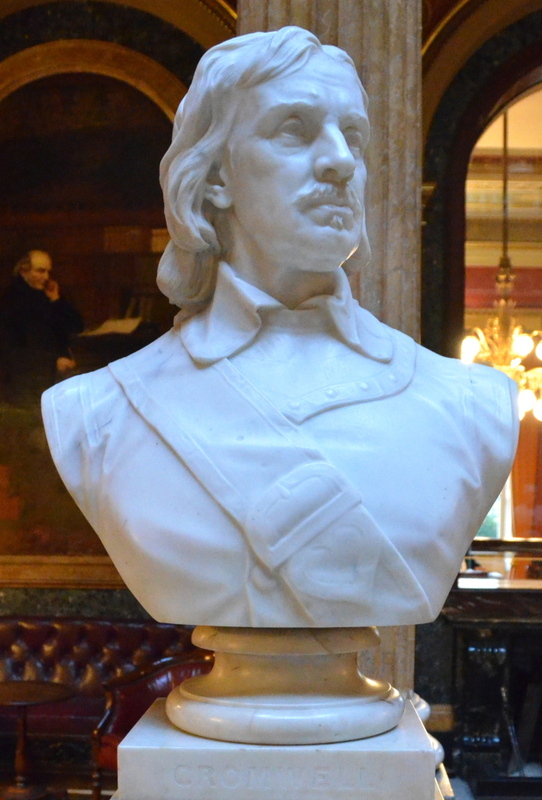 A statue and a bust of Cromwell One on the left by Sir W. Hamo Thorneycroft; one on the right by Matthew Noble. Click on thumbnails for larger pictures. Oliver Cromwell (1599-1658) remains something of an enigma. His early life was conventional: he was born into a family of Huntingdonshire gentry and educated at Huntingdon, Cambridge, and Lincoln's Inn. He lived quietly on his small estate and took an active part in local political affairs, representing Huntingdon in the parliament of 1628 and Cambridge both in the Short Parliament — which was summoned by Charles I to provide money for a campaign to reintroduce episcopacy in Scotland, but during which many members who sympathized with the Scots organized opposition to his policies, provoking the unhappy monarch into an abrupt dissolution of parliament which further alienated his opponents — and in the Long Parliament, which won the constitutional reforms from Charles I which the Parliamentary party would be called upon to defend in the Civil Wars. His social, political, and religious attitudes at this time — he was a devout Puritan — were all typical of his class. The Civil Wars, however, which broke out in 1642, when Cromwell was forty-three, made it clear that he possessed unexpected talents and abilities. Though totally lacking in previous military experience, he created and led a superb force of cavalry, the Ironsides, and rose from the rank of captain to that of lieutenant-general in three years, displaying, at the same time, a paradoxical mixture of religious sincerity and astute political opportunism. 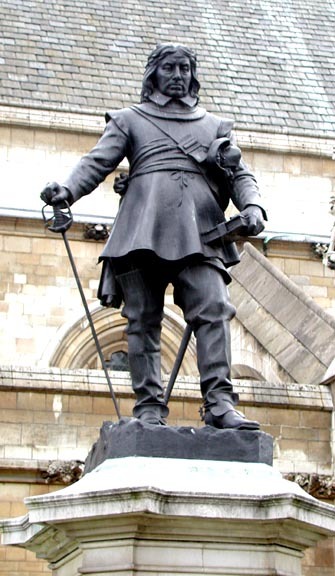 Before 1645 he was one of the parliamentarians who refused to compromise with the loyalists, and again, in 1647, he took the side of the New Model Army in the face of attempts to disband it. He was a prime mover in the trial and execution of the King in 1649, and after the Commonwealth (1649-53) was established, he became lord-general and commander in chief and lord lieutenant of Ireland, where he presided over the massacres of the garrisons of Drogheda and Wexford. In 1653, after the expulsion of the Rump Parliament, he became lord protector (which is to say chief executive) of the Commonwealth. The Commonwealth proper, however, ended with the establishment of Cromwell's Protectorate (1653-58), which was characterized by religious toleration, profitable commercial treaties with several foreign powers, and several sucessful wars. The Protectorate endured, however, only while Cromwell lived, collapsing after his incompetent son Richard alienated both the Army and Parliament in his attempt to succeed him.